There are many advantages to choosing a rental agreement over the traditional financing of a new heating or cooling system. For starters, system often need to be replaced with little or no warning at inconvenient times. If a furnace was to stop functioning in the middle of harsh winter temperatures, it can even be an emergency situation. Similarly, extreme heat is dangerous to very young children, the elderly and those who have conditions that can inhibit breathing. With these factors in mind, when purchasing a new HVAC (Heating Venting and Air Conditioning) system there is often no time to shop around for the best deal, let alone try and figure out how to pay for it. That is why we have come up with a program to allow property owners to have high quality heating and cooling units with no money down and affordable monthly payments. We take the guess work out of choosing a new unit. We only work with the best brands like Amana, and Goodman. Our air conditioners have SEER (energy efficiency) ratings of 14 and up and our forced-air furnace rental units have AFUE (Annual Fuel Utilization Efficiency) ratings up to 98! When you choose to rent, you are choosing an option that offers no upfront costs. There is no down payment required. That means that you don’t have to worry about coming up with thousands of dollars to fix a potentially dangerous situation. Instead we offer you free installation, with up to 15 feet of venting or duct work. We will also remove you old unit at no charge. When it comes to your rental agreement, as long as you are a property owner, our flexible credit approval means you’ll almost certainly be approved! By choosing to upgrade your heating and cooling systems, you are choosing to save yourself money. By replacing a 15 year old heating system with one of our energy efficient units you can save up to 45 per cent on your energy bills and emit 50 per cent less emissions. In addition, by upgrading your existing units, you can receive up to $650 in government rebates. We will even apply for the rebates for you to make it as easy as possible. You may even qualify for additional rebates from your local gas supplier! When you choose a rental agreement, you are choosing protection for now and for the future. With every rental agreement comes free annual maintenance. We will send a licensed HVAC technician to your home for a free annual inspection. By keeping your systems running properly, they will run as efficiently as possible keeping your energy bills low. If your system(s) ever have any issues you don’t have to worry about calling around to find an affordable service company. Instead our customers have access to our 24 hour 7 days a week emergency line. One call gets you expedited service and best of all, it’s absolutely free. If for any reason we can’t fix your issue, we will replace your unit, absolutely free. Located approximately an eight-hour drive from Toronto, Saulte Ste. Marie offers a retreat option to suit everyone’s tastes. Those looking for adventure can try the scenic train tours winding through picturesque landscapes. Two or three night packages are available in the summer or fall. Those who want a hands on adventure can try their luck with a fishing or golf retreat. You can also explore your creative side with an artist retreat or put your feet up and enjoy a spa getaway. Those who choose to call Sault Ste. Marie home get to enjoy the fun all year around. In the summer you can enjoy a complimentary wagon or tractor ride to the Arts at the Docks waterfront festival. The biggest party of the summer is Rotary fest. Located at the picturesque waterfront, the celebration includes a music stage, a colour run, parade and fun zone. Winter is still fun in the Soo. Northern Ontario’s largest winter carnival, the Bon Soo is 10 days of fun. From snowshoeing, dog sledding, bum slides, snow sculptures and more. There is indoor and outdoor events for everyone from preschoolers to seniors. 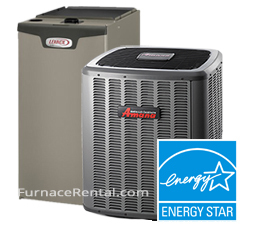 When residents are ready to escape the extreme winter and summer temperatures, they know there is no better option that an energy efficient furnace or central air conditioner rental.